Since hubby and I are trying to cut down on how much sugar we consume, I have been searching for recipes with a bit of sweetness to it and will maybe satisfy that urge. Late in the year, here in Central Florida, its orange season and so I thought an orange flavored muffin would be great and with it also being fall, how about something with cranberries in it. I have NEVER cooked with cranberries before because they are not a favorite of mine. 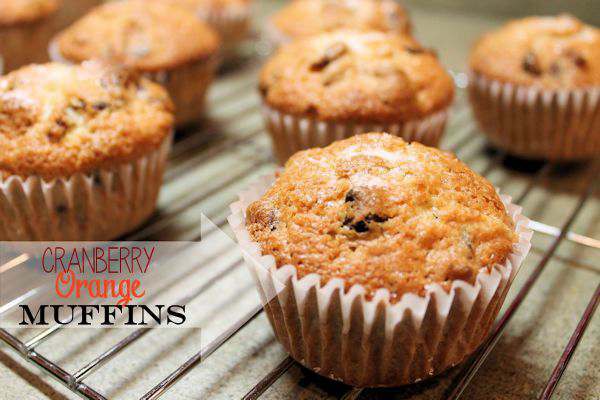 I found a few recipes and came up with my version of Cranberry Orange Muffins. I used craisins instead of cranberries and of course, I had to add dark chocolate morsels which only makes any recipe better. Lightly spoon flour into dry measuring cups; level with a knife. Set aside 1 tablespoon sugar. Combine flour, remaining sugar, baking powder, salt, and baking soda in a large bowl; make a well in the center of mixture. Combine rind, juice, oil, and egg in a small bowl, stirring well with a whisk. Add to flour mixture, stirring just until moist. Fold in cranberries and walnuts. Spoon batter into 16 muffin cups coated with cooking spray. Sprinkle evenly with reserved sugar. The recipe says it makes 16, but I used my 12 muffin pan and just filled them to the top (which made the cooking time to 17 min and I also used cupcake liners for easier cleanup. I used fresh juice from an orange. These sound awesome! 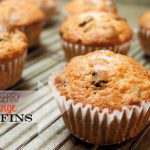 My kids LOVE muffins and I’m always looking for new ones for them!